Often an important first step in diagnosis of unwell pets, we offer radiology services in house and will have results available for you on the same day. If your pet requires x-rays to be performed they will usually have to take place under sedation or a full anaesthetic, so they will be required to stay with us for the day. All radiology is performed by appointment or under emergency circumstances only. 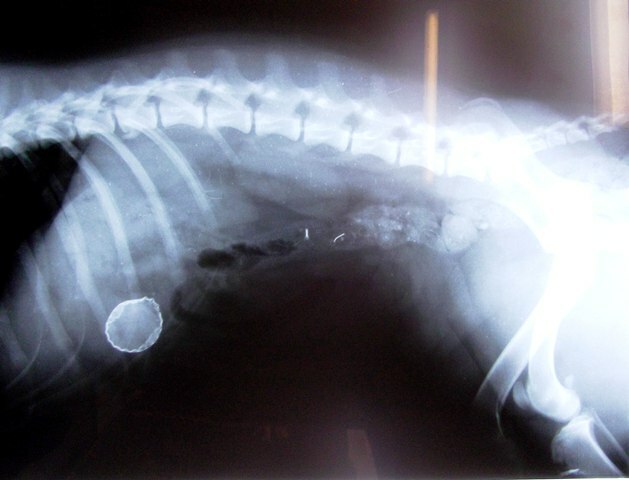 This unfortunate patient had swollowed a bottle cap which can easily be seen in this x-ray. You will be pleased to know this patient made a full recovery after surgery.